Firstly, let me express our deep gratitude to UNCTAD, with FAO, for organizing today’s event and for extending an invitation to CITES. CITES was signed on 3 March 1973 in Washington DC – and as we all know, 3 March is now celebrated annually as UN World Wildlife Day! CITES regulates international trade in wildlife – at present over 36,000 species of animals and plants fall under CITES trade controls, both terrestrial and aquatic, including all parts and derivatives. The Convention is well known globally for elephants, tigers and rhinos - but CITES also has long history of regulating trade in listed marine species - cetaceans, clams, corals, sea horses, the queen conch and more as is shown in the slide. Over the past two CoP (meetings of the Conference of the Parties) cycles, in 2013 and 2016, CITES Parties have increasingly used the Convention to regulate trade in marine species, including commercially harvested sharks and rays. Most commercially exploited marine fish listed under CITES, in particular sharks, are found on Appendix II – this allows for regulated trade through the issuance of permits to ensure trade is legal, sustainable and reported. The listing of a species under CITES is based on proposals by any one of its 183 Parties (182 States and the European Union), and proposals are discussed and determined at each CoP, which is on a three yearly cycle. Listing proposals are assessed against agreed scientific criteria, with the criteria for marine listings being quite strict, including when compared to terrestrial species under CITES. While proposals are put forward based upon an assessment against scientific criteria, the ultimate decision is for the CoP. Where there is no consensus amongst Parties, decisions are taken by a two thirds majority. An FAO Expert Panel is convened before each CoP (when there are relevant marine listing proposals) and it plays an important technical advisory role in the case of proposals concerning marine species. This process is unique to marine species under CITES. Not all proposals submitted to a CoP are accepted. For example, blue fin tuna was rejected through a vote in 1991 (CoP8) and 2010 (CoP15), as were various shark proposals in 2007 (CoP14) and 2010 (CoP15). However, proposals to list new shark species, as well as rays, presented in 2013 (CoP16) and 2016 (CoP17) were all accepted, after a vote. CITES has an effective compliance mechanism, which is used by the Parties – and, as mentioned, it votes when there is no consensus. These are two defining features of CITES. This compliance mechanism includes a well-developed process for the review of significant trade through which the Convention’s two scientific committees (animals and plants) review the levels of trade. This was done, for example, with the trade in the queen conch on two occasions, following which the trade has proceeded on a sustainable footing, which is good for the species, the local fisher folk, and the people who like to eat the meat. CITES approach is species-specific, down to earth, and practical. The Convention was described in ‘The Future We Want’ as an international agreement that stands at the intersection of trade, the environment and development (Rio+20 para 203). UNCLOS (the United Nations Convention on the Law of the Sea) provides the overarching international legal framework for the conservation and sustainable use of oceans and their resources, which is also reflected in the CITES text itself (Article XIV 6). CITES works as a complimentary instrument within this agreed legal framework. CITES uses trade-related measures to achieve conservation objectives – so its relationship with the World Trade Organization (WTO) is extremely important. We have a very effective working relationship with the WTO – and there has never been a trade dispute under the WTO directly challenging a CITES trade-related measure. The reasons for this highly effective relationship have been set out in some detail in the joint CITES-WTO publication ‘Enhancing Cooperation for Sustainable Development’. For fisheries, CITES is at the interface between sustainable use and international trade, focusing on species that have declined to a level that require strong management measures to maintain or rebuilt stocks. CITES sets the legal framework for international trade in these species to ensure they are not over exploited through trade – and in this way it helps to ensure the long-term sustainability of these resources. CITES shares common principles with the Fish Stocks Agreement in the form of taking a precautionary approach and ecosystem approach. CITES provisions allow integration of regional approaches for management of migratory and straddling fish stocks, for example CITES authorities can base their sustainability assessment – known as a non-detriment finding or NDF - on regional fisheries management organizations and agreements (RFMO/A) data and findings. CITES is deeply engaged in capacity building to assist Parties, in particular developing countries, to overcome the challenges in complying with CITES requirements on commercially exploited fisheries species. Research and capacity building activities have been conducted in very close collaboration with the FAO and RFMO/A, which efforts have been specifically recognized in UN General Assembly Fisheries resolution. CITES also includes one of the few existing provisions covering areas beyond national jurisdiction, which under CITES is called “introduction from the sea” under CITES, which requires its Parties to make an analysis of legality and sustainability when introducing CITES-listed species from the high seas, including taking into account compliance with relevant international instruments. There are also synergies with FAO Port State Measures Agreement (as reflected by CITES involvement in most of the regional capacity building workshops prior to entry into force of the Agreement), which I will not go into today. This issue is theoretically straight-forward from CITES perspective – and today I will focus on Appendix II listed species, which can be commercially traded provided it is legal, sustainable and reported. For the export of CITES specimens, the exporting country needs to be satisfied that specimen was not obtained in contravention to the laws of that state – namely it is legal – and that the trade will not be detrimental to the survival of the species in the wild – namely it is sustainable – and this involves a scientific finding, and the trade must be reported to the Secretariat, which is made publicly available through the CITES Trade Data Base. For transit and importing States, they need to sight the necessary permits, and cannot import a CITES specimen unless it is accompanied by the required permits. The Convention imposes obligations across the supply chain – from source to transit to destination States. The World Wildlife Crime Report prepared by the UNODC says CITES sets the international rules that the criminals try and evade. However, these legal requirements can also present challenges to exporting countries, for example with traceability of specimens in trade and the need to take into account the IUU take in determining what is a sustainable harvest, as is reflected in the non-binding CITES guidelines on the making of NDFs contained in Resolution 16.7. 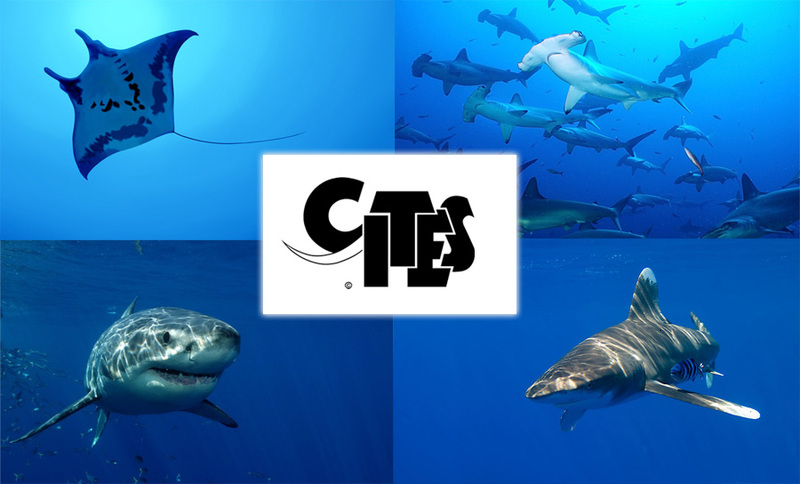 CITES has commissioned studies on shark traceability to support its Parties and has contributed actively to FAO processes on traceability and catch documentation schemes. CITES as part of the ICCWC (the International Consortium on Combatting Wildlife Crime) also provides coordinated support to Parties national and regional enforcement efforts. We see CITES as being the direct opposite of IUU – illegal, unreported and unregulated – CITES is LRR – legal, reported and regulated! Affect the ability to sustainably harvest wild stocks, making it hard to make a NDF, or leading to concerns of over exploitation through the review if significant trade and the use of CITES compliance measures. CITES tackles the result of certain subsidies, namely overexploitation, not the subsidies as a driver. CITES amended its CITES Strategic Vision last year at CoP17 recognizing CITES contributions to the Sustainable Development Goals. The day before CoP17, a Ministerial Lekgotla was hosted by the South African Minister for Environmental Affairs, the Hon. Dr. Edna Molewa, on CITES and the SDGs, which attracted over fifty Ministers. CITES plays a specialized role in advancing implementation of SDG 14.4 – namely, implementing science-based management plans and rebuilding overfished fish stocks to sustainable levels, as a trade-related measure complementing the work of other organizations to improve fisheries management, for example with FAO and RFMO/As. CITES regulates species impacted by international trade to avoid overexploitation and the corresponding loss of environmental and social value by putting in place a legal framework requiring controls of sustainability and legality, underpinned by compliance mechanisms. Through assistance to its Parties, CITES also contributes to knowledge, capacity and technology transfer to developing countries (14.a), some of which specifically take into account the needs for small-scale artisanal fisheries (14.b). CITES Parties have also adopted resolutions on livelihoods and engaging with rural communities (14.b). Livelihoods and engaging with rural communities was stressed at CoP17 and local fishers, traders and industries are likely to be more supportive for CITES trade-related measures if they are engaged in the process and derive a have socio-economic benefit. CITES remains committed to work in close collaboration with FAO and RFMO/As. In fact, just last week, we had a joint meeting in our offices here in Geneva with representatives of FAO and RFMO/As. We are also committed to working with WTO and UNCTAD to advance implementation of SDG 14, under the agreed principles set out in UNCLOS and Fish Stocks Agreement, as appropriate. CITES in the past has collaborated with UNCTAD on traceability and livelihoods, mostly with a focus on terrestrial animals and plants. There are also many synergies in our marine work and CITES will be part of a side event during the UN Oceans Conference to be held in New York, 5-9 June, titled: “Blue BioTrade: Harnessing trade and investment for sustainable use”, jointly organized by UNCTAD and others (the Development Bank of Latin America and the Smithsonian Institute). The role of international trade regulations in ensuring marine species are not overexploited is perhaps something that could be reflected in the outcome document for the UN Oceans Conference, “Our Ocean – Our Future” Call for Action, which is currently being considered by Member States. Colleagues, we are all striving to achieve the same objective of sustainability – where wildlife, be it terrestrial or marine, can survive in the wild while also benefiting people. For this we need a joint effort and you can count us in!